Chart No. 29 - Respiratory and Autonomic Sensory Reflex Therapy for Mental-Emotional and Nervous Tension Release. This is a gentle relaxing technique by the use of the penetrating prana energy in the breath, which must reach every cell of the body. It is a sensory contact applied through the poles of the diaphragm, by gentle polarizing contacts as in perineal therapy [see Charts 30 and 31]. The application of the introduced neuter [neutral] force is of the principle of balance (sattwa [sattva]). It should be used first to relax the mental, emotional nerve centers and to balance the active spinning chakras in the wireless field. Other treatment may follow. Deep rhythmic breathing assists the energy to travel with the neuter [neutral] life current in the body. The two thumbs and the big toes are neuter [neutral] energy conveyors because they are in the center line. One thumb opposes and supports four polarized currents in the four fingers, making skill and a firm grip possible. It is a practical illustration of the one river of energy (the ether) flowing out of paradise and splitting into four branches. These 5 [five] rivers are 5 [five] modes of expressions of the soul thru [through] energy currents. 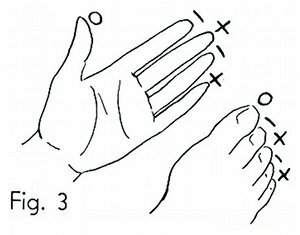 They become the 5 [five] motor and the 5 [five] sensory centers and they flow as 5 [five] currents thru [through] the 5 [five] fingers and toes. Thru [Through] perception and mind action, they become motion and skill thru [through] the sense of touch. 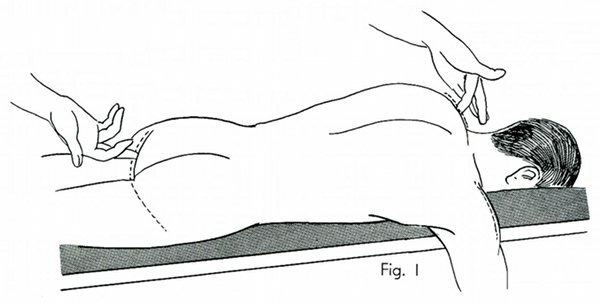 The fingers must not touch each other while giving this sensory-polarity treatment. The lightest touch or proximity counts in polarizing sensory centers. The buttock lines posteriorly are extensions of the perineal line of the negative pole of the diaphragm. They reflex to the positive respiratory lines above. Sensory currents are ingoing currents. Gentle contacts accomplish much with a positive finger on the negative pole and a negative finger on the positive pole merely directing energy thru [through] polarity and respiration. Every cell is alive; tissues respond to the rhythmic flow of prana energy in the breath. These gentle impulses go deep and release sensory mechanism blocks by polarizing and balancing of the superior and the inferior or the within and the without. It is like perineal technique, a therapy for balancing respiratory, emotional and sensory energy currents.